Oh my! I have had a hard time getting this post up this morning:( Picture me sitting in a hotel room in Portland, OR with my feet up blog hopping around to see what's going on in the A to Z Blogging Challenge world! There are some seriously good P posts out there today! Good Job! Then, my sister is in the hospital with a blood clot in her leg. They are anticipating doing a "clot busting procedure" on her today as her leg is really swollen--abnormally so even for a blood clot! So I have been emailing and texting friends and family to facilitate prayer and a pastoral visit for her. If you would pray too, that would be nice. Well, on to the post of the day...maybe I can finish it this go-round! I didn't keep it very short today; sorry! As I was thinking about this post and how it related to the theme of All About Me (it is all about me, right? ), I thought, "P is for Patience (don't have a lot of that); Procrastination (I'm an expert on that one); Preserving Food (well, I do and have done a lot of that); aha! (don't you love aha moments:) Paper Crafting!!! I have to work my paper crafts into this challenge whenever I can because it is what I truly love to do! Besides, what would the month be if I didn't show you some paper crafts, right?!!! Wednesday night my Happy Stampers made a Card in a Box! 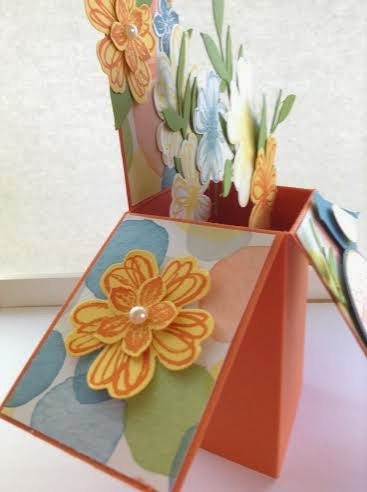 It is quite the paper crafting sensation at the moment--lots of postings on Pinterest! 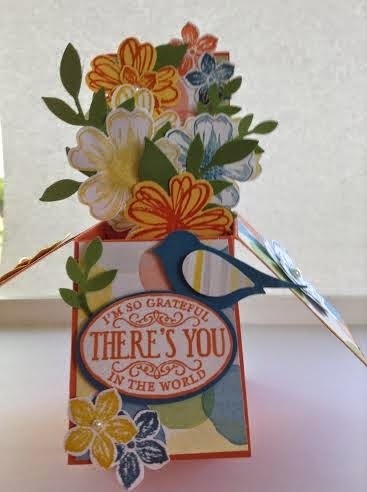 I was inspired for this one by Tina Weller at The Serene Stamper (this link will take you to her post with video tutorial as well as printable instructions). Thank you Tina for the great tutorial!!! Tada! Isn't it the cutest thing?!!! The box folds flat for mailing:) We did make special envelopes for our creations because they wouldn't fit in our standard size card envelopes but that was made easy using the Envelope Punch Board--love it! I could not believe how fun this was to make and decorate! It would be hard for you to enjoy this project as much as I did, but I hope you enjoyed it nonetheless! I will be back tomorrow with the Letter Q--only 10 more letters to go!!! Last year I felt like such a winner when I completed this challenge! Very cute card! I hope your sister gets well soon. So beautiful. Nice to meet and connect through the AtoZ challenge. Thank you! 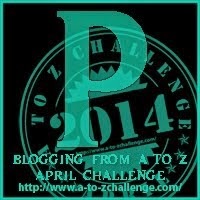 A to Z Challenge = fun! You do beautiful work on this! Thank you so much William! I do love it!!! Thank you Carla! It is "the thing" in paper crafting on Pinterest right now! It was so much fun to make! Lovely card and a beautiful post for P. Hope your sister is better.